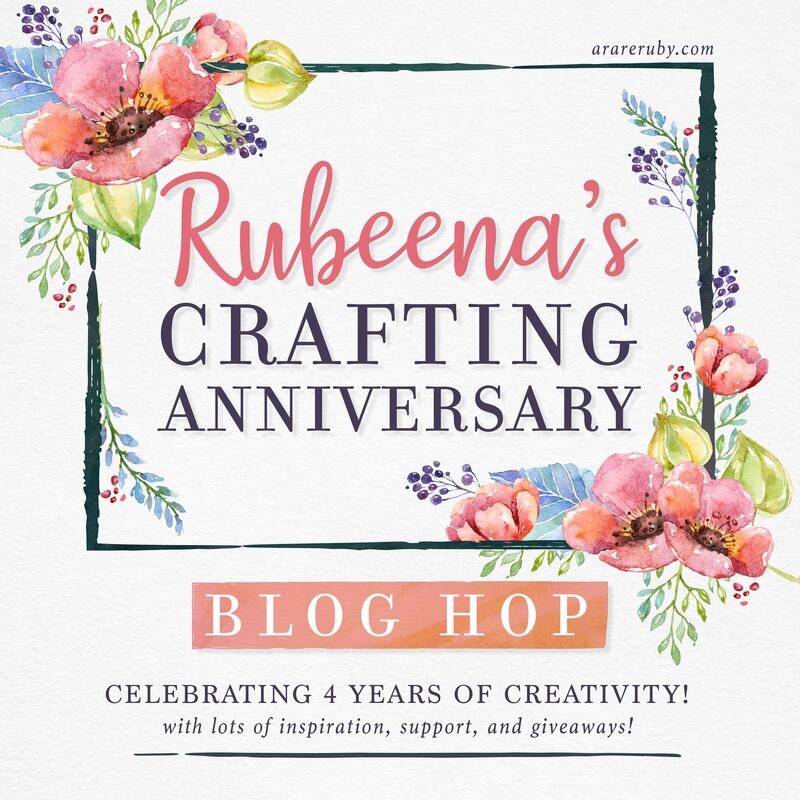 Today I am joining my friend Rubeena Ianigro in celebrating her four-year crafting anniversary. If you came from her blog, you are right on track! In light of this celebration, I thought I would share a little fun fact about my discovery of clear stamps. I have been crafting and making cards from a very young age, but I only discovered stamps more recently – about seven years ago. One day I was out buying some ink pads for two woodblock stamps that I had received as a gift. Near the ink pads aisle, I noticed some clear rubbery material which had the word ‘stamp’ on its package. I thought they looked interesting and bought a couple of them. Now here is the funny part, I didn’t buy any blocks, for I had no clue that clear stamps needed blocks! Instead, I simply peeled them off their sheet and tried to ink them using my hands like you would use a block. You can imagine how frustrated I was with the process! However, it wasn’t long before I realized that I needed to get those ‘glass blocks’ which I had seen next to the clear stamps but had no idea what they were at the time. I also had no idea how much I was about to get involved with clear stamps! For today’s hop, I decided to create a card using one of my all-time favorite techniques: applying ink with a sponge applicator. I mostly combine this technique with masking, but this time I did something different. 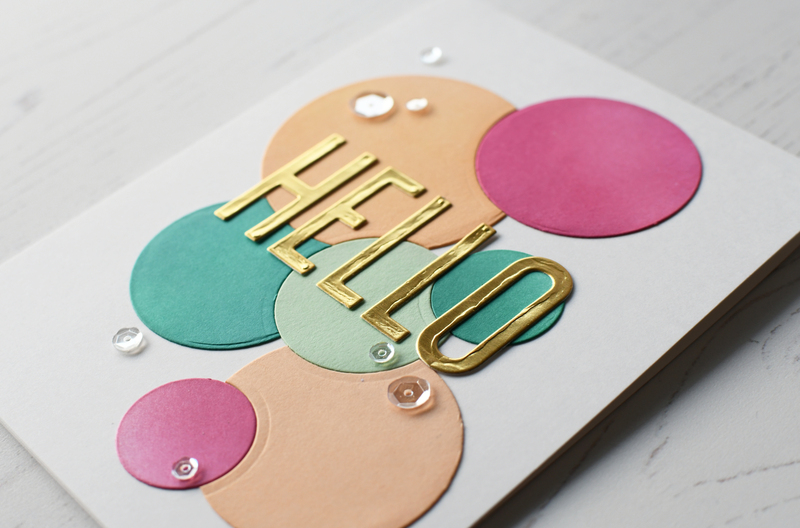 Using the Halftone Circles Nesting Die Set, I die cut circles of various sizes from the same piece of white cardstock. I overlapped some of the circles so I could arrange them like puzzle pieces. 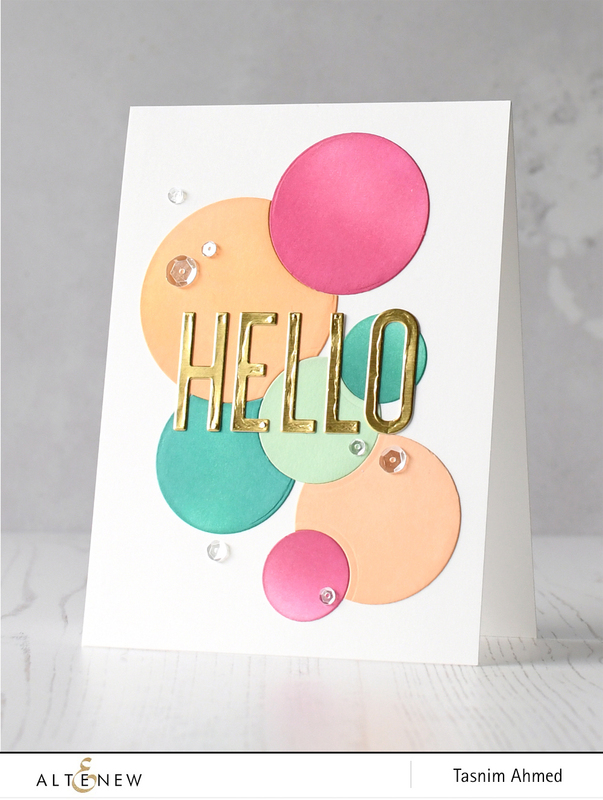 I used the following Altenew Crisp Dye Inks: Peach Perfect, Rubellite, Minty Mint, and Lagoon to color my die-cut circles using a sponge applicator. For the sentiment, I used the Fine Alphabet Die Set along with some Gold Foil Cardstock. 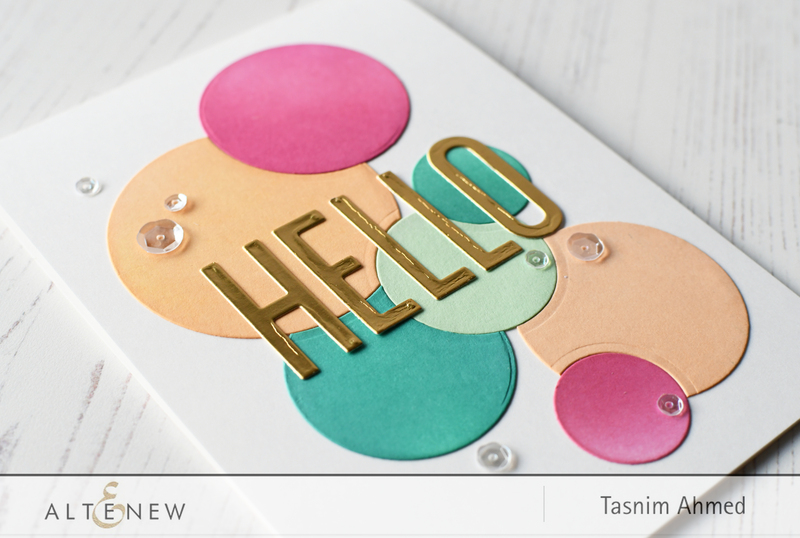 Love the design and colors you used with your card. Thanks for sharing your story, I also didn’t know about the blocks for clear stamps as I had always used rubber stamps on wood blocks. Luckily there was a nice lady at the paper crafting store that showed me how they worked! Now I’m hooked. Darling stamp story!😉 Love the interlocking circles!! Huge congrats to Rubeena and thanks for sponsoring this hop! I love your story of how you discovered stamps! I too recently discovered new techniques for card making especially since finding all of these wonderful blogs and YouTube tutorials! So excited to have been brought to your blog in this awesome blog hop! Such a beautiful card! Really cool card! Love the colors and the arrangement of circles.. quite “mod”! And thanks so much for being a sponsor! OMG! What a GREAT idea…beautifully done! Lovely card: clean and simple yet unique! I love how you overlapped the dies, for the puzzle look. What a great idea for this technique and to ‘thank’ all of the wonderful sponsors who chose to celebrate Rubinnas world of c acting. Congratulations on your own journey, and look how far you have come and have so many followers like me!!! We are your avid fans and cheerleaders and will continue to love this journey we are all on! And now we can stamp using a MISTI or clear blocks as well!! Lovely card too!! What a simple but beautiful card. I love how the colors are the focus. You could use for any occasion. Thanks for sharing. Lovely stamp story.. Such a simple and perfect card. Congratulations Rubeena! I love your style! Thanks for all the inspiration you give.